Make it easy to add and remove a layout to a group. 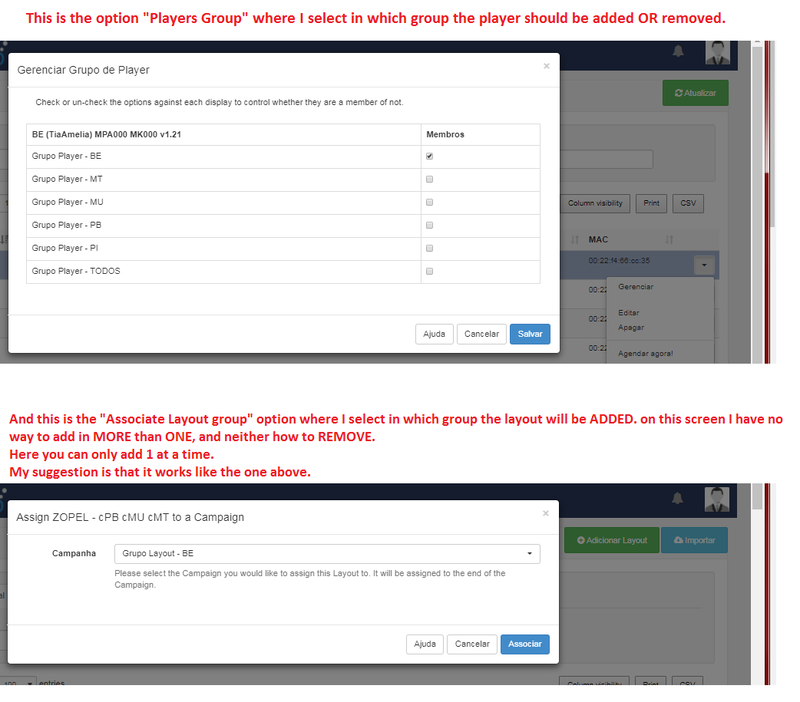 To add or remove a Player to a Group, simply go to the “PLAYERS GROUPS” option and then select the groups to which you want to assign this player. 01 - To add or remove a layout to “more than one group”, it is necessary to repeat the process several times. 02 - In addition, it is not possible to see in “what and how many groups” each layout is assigned, to know also it is necessary to open the groups one by one. How about replacing the “ASSOCIATE LAYOUT GROUP” function with “LAYOUTS GROUPS” in the same way as in “PLAYERS GROUP”? This will solve these two issues that I listed above. Just so we fully understand the use case - why are you assigning many Layouts and Display Groups together? (this is absolutely fine, but it would be good to understand why). To speed up insertion and removal of videos without having to make new schedules frequently. 01 - I create a Layout for each video, and then I create a group of Layouts containing the ones that should be displayed in a city. 02 - Then I create a group of players by City. 03 - Then I Aging each Layout group to the Players group of the same city. 04 - In this way, I only have to add new layouts to the group so that it is automatically displayed in the players, without the need to schedule the layouts. 05 - The same happens with the Players, all I need is to add them to the group so they can receive the videos of the previously scheduled layouts. But the most important issue in this request is to streamline the management of layouts groups, just as it is with the players. You can not unassign in the same way, you must go to the group of layouts to do. It is not possible to clearly visualize in which groups each layout has been assigned, being necessary to open one by one. Oh I see - you mean Campaigns? Can you show me a screenshot of what you mean, so there is no confusion. Right, I understand you now. They are totally different concepts though - the first one is implying a “membership”, the Display belongs to the Group. The list of Display Groups is static and represents your actual inventory and network configuration - it isn’t going to change very often. The second one is an assignment - the Layout is added to the end of the campaign. Campaigns are transient, they might be there for a short period of time, then deleted. There could potentially be 1000s of them, even for a single Display network. In the second one it could be in multiple campaigns, multiple times. I am not sure whether your suggestion is a good improvement or not - we will leave this feature request open to gather other opinions. All you have to do is add one in which you could add Layout to multiple layout groups at once. or remove them at once.